A British Native Teacher –Philip is born and bred in the United Kingdom. Therefore, you can be assured that the English you will learn with him is exactly as we would use here in London. You will practice the correct pronunciation, sentence stress and intonation during the lesson to help make you a much better English speaker. A key factor in relation to how you speak is also the speed of your sentences and words. We will ensure that over time that you speak at exactly the correct speed when pronouncing the English words. We feel confident that in a short period of time your pronunciation will improve and you will feel more positive when speaking English. We will speak about 2 topics. We think it is important to converse about many different topics even if the topic might sometimes be a little difficult or unusual, it will be great practice to help you speak in the real World. 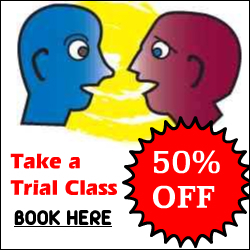 During the Trial class the 2 topics will not be difficult but they will be interesting and your Teacher Philip will ensure that you do a lot of the speaking and that you really get a good opportunity to practice the language. This email contains notes / errors / Teacher comments etc. You will be able to see some of your common mistakes as well as tracking your progress and a reminder of new words learned. Many Students think that the After Class Email is the perfect ingredient to accompany their English classes. If you have made repeated grammar mistakes or you have used the wrong words or phrases during the class, your Teacher Philip will record these in your EMail to allow you to review them and to understand where you have gone wrong and how you can improve. The ideal way to listen back to your class on your IPOD, Car, PC etc. It is a fantastic way to hear your English improve after each lesson. In addition, the MP3 can be a great way to monitor your pronunciation and general progress over time. What happens after payment ? You can immediately start to reserve your classes. You will be forwarded to the reservation page and invited to start reserving a class time that suits you. You can reserve your classes up until 4 weeks in advance of today. If at any time you have any questions please contact us by either using the live chat option at the bottom of this page or by sending us an email. We are very sure our classes will help you speak English better and that you will enjoy them.